This ready-to-use wetting agent and surfactant solution provides superior wetting, penetrating and coalescing of Asbestos Containing Material (ACM) to permit handling and removal of these materials under damp, dust-free conditions. Penewet is a non-flammable, water-based liquid that will not corrode aluminum components of spray equipment. Carefully clean up with a wet mop or HEPA vacuum. Stir Penewet thoroughly to achieve a uniform consistency. Penewet is pre-mixed, water addition is not necessary. 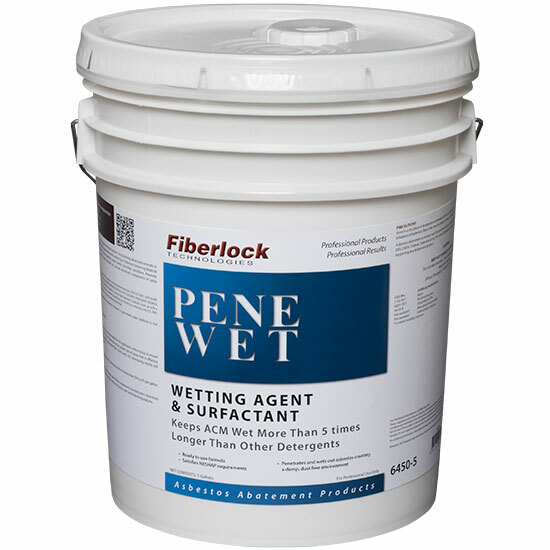 Apply Penewet with an airless or pump sprayer. Apply Penewet initially at full strength. Wait a few minutes after the first application and re-spray to ensure adequate penetration and saturation of ACM. After determining the proper rate of spray that is effective for the removal of the ACM, and documenting acceptable fiber count levels. Air monitoring results will determine the suitability of this procedure. Depending on thickness and porosity of the material, coverage should not be less than 500 sq. ft. per gallon. Tools and drippings should be cleaned with warm soapy water. Follow equipment manufacturer’s directions to clean spray equipment. Dispose of all waste according to current local, state and federal regulations. Store in a dry place at temperatures between 40°F (4.5°C) and 90°F (32°C). Approved respirators must be used to prevent inhalation of asbestos fibers that may be present in the air. Protective clothing should be worn. Careful consideration should be given to all EPA, OSHA and state regulations in effect at the time of application of Penewet.